CIMMYT is pleased to announce the release of a set of 16 new CIMMYT maize lines (CMLs). These CMLs were developed at various breeding locations of the CIMMYT Global Maize Program by multi-disciplinary teams of scientists in sub-Saharan Africa, Latin America and Asia. These lines are adapted to the tropical and subtropical maize production environments targeted by CIMMYT and partner institutions. The CGIAR program on MAIZE, CIMMYT and IITA are pleased to announce that MAIZE is to be led by a dedicated CRP Director to spearhead the international maize research agenda of CGIAR. The CIMMYT Board, upon endorsement of the MAIZE Stakeholder Advisory Committee (StAC), has agreed to the CIMMYT Director General appointing Dr B.M. 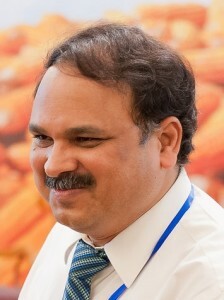 Prasanna as MAIZE CRP Director.